By Nick Howell on 04/22/2015. You’ll understand why by the end of this post, I promise. It’s a long one with a lot of data. Coffee and focus required. Whether you want to believe in it or not, whether some vendor who doesn’t participate tells you its irrelevant because of some reason that makes them look bad, the Storage Performance Council is the top dawg when it comes to the performance benchmarking of enterprise storage systems. There is always a lot of himming and hawing over these results, their validity, how vendors game the system, “anyone can build a dragster,” etc etc etc. It’s old and tired. So part of this post is not only going to be a brag, but also a breakdown of WHY these results matter, not just the results themselves. Why it’s not just about sheer IOPS delivered, but the cost in a $/IOPS figure with real workload simulations (not just random 4k reads), and the low latencies required to deliver those IOPS at those costs. What is the Storage Performance Council? The goal of the SPC is to serve as a catalyst for performance improvement in storage subsystems. It works to foster the free and open exchange of ideas and information, and to insure fair and vigorous competition between vendors as a means of improving the products and services available to the general public. … as well as all the adapters, controllers, and networks that connect storage devices to the computer system. Let’s review some common talking points about the SPC-1 right off the bat, and put to-bed any myths or misconceptions that may be floating around out there, by truly defining what this benchmark encompasses. This is set up intentionally to be extremely repeatable, but also tends to be a very “write-intensive” workload; way more than just about any other benchmark out there. In a way, this invalidates a lot of your dragster/supercar comparisons out there. This test is not just about straight reads. Though not impossible, it is extremely difficult for vendors to “overengineer” their systems to effectively use cache to increase results, preventing vendors from gaming the system. This particular benchmark has been designed to simulate conditions that customers frequently encounter. This is done independently outside of any influence from storage vendors. Sure, the SPC-1 allows systems of different sizes to be compared to one another, but at the end of the day, it’s all about the value. Not every single storage system is alike, and most vendors worth their salt have more than one result showing a chain of value across their entire portfolio. Smaller and less-costly systems are certainly going to produce lower performance on paper, and larger more costly systems are going to produce higher performance … BUT … it’s still all about the $/IOPS. You can build the biggest, baddest IOPS-churning dragster all.day.long, but the result is completely and utterly meaningless unless you also know the response time associated with the IOPS achieved. Perspective: Would you rather have a system that does 2 Billion IOPS, but requires a bajillion disks and runs at 20ms latencies, or would you rather have a system that runs 650,000 IOPS in 2U that delivers it in <1ms? What you have to understand wholly in order for these tests to mean anything to you is that this top-end number doesn’t relate to how responsive the system will [or will not] be to application demands. This doesn’t completely discredit the test as a whole though. Don’t jump there! I’m simply commenting on the “top speed of your dragster” and the irrelevance of it to your real-world datacenter. 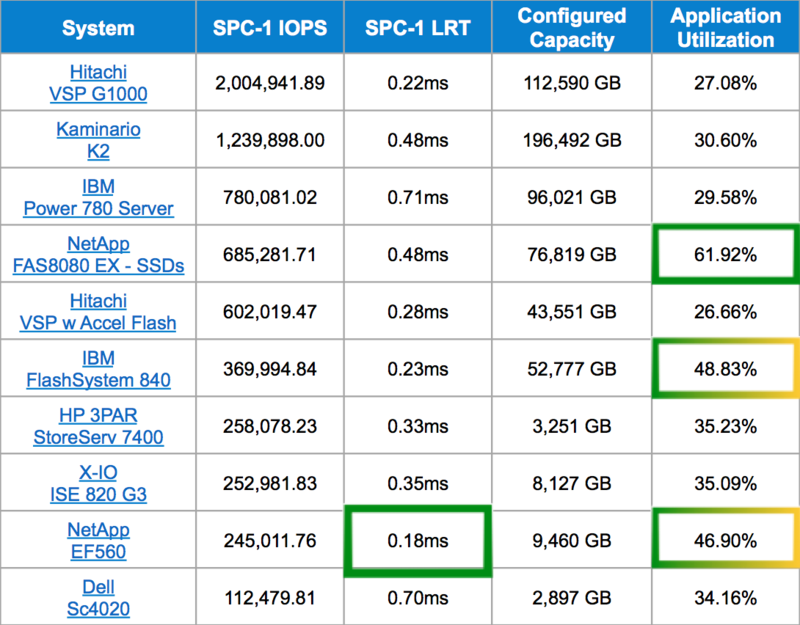 Those numbers are not captured for bragging rights, they are captured to put into a $/IOPS value formula. Ask any app owner, DBA, Exchange admin, MSSQL engineer … it’s highly likely that your performance metric means nothing if the storage system cannot keep up with the response time requirements they and their applications demand. This is hands-down THE most important and consequential metric related to performance. Did you forget about RAID? I bet you did. It’s certainly not the first thing that comes to mind when talking about performance drag races. It’s got some overhead. Do you think all of the vendors used the most resilient configuration or the most conveniently performant configuration? Again, these numbers mean jack squat if the tests were run on anything below a double-disk parity solution. Why? It’s 99.999% unlikely you’re ever going to run anything but that in production, regardless of vendor. NetApp will always run RAID-DP in FAS. Why would this matter? This is another one of the big mistakes … or should I say, things often overlooked. Without calling anyone out, I’ll simply tell you that you need to be sure you’re examining and understanding the amount of hardware that’s required for a particular vendor to achieve measured performance levels. Understanding the percentage of application utilization and unused storage ratio will help reveal efficiency and validate the test. Bottom line, there are many things to keep in-mind as we review the results below. If you’re unsure about any of these results or why they should matter to you, leave us a comment at the bottom, and we’ll be happy to address them! Kieran … Dim the Lights … Here We Go! This is all information available in the full disclosure reports of each of these results, current as of April 22, 2015. We’re not disclosing anything that isn’t already publicly available. We’ve simply organized it so that it’s sorted by the total SPC-1 IOPS number, as well as highlighting some of the other key metrics, such as what we were calling attention to earlier in the post. Before the chart, I referred to these as relevant results. To me, they’re relevant for several reason, but primarily these are often the vendors we find ourselves up against or compared to in competitive situations, or they have simply posted some astounding results, and I wanted to call attention and discuss some additional points around performance and capacity as it relates to the benchmark. 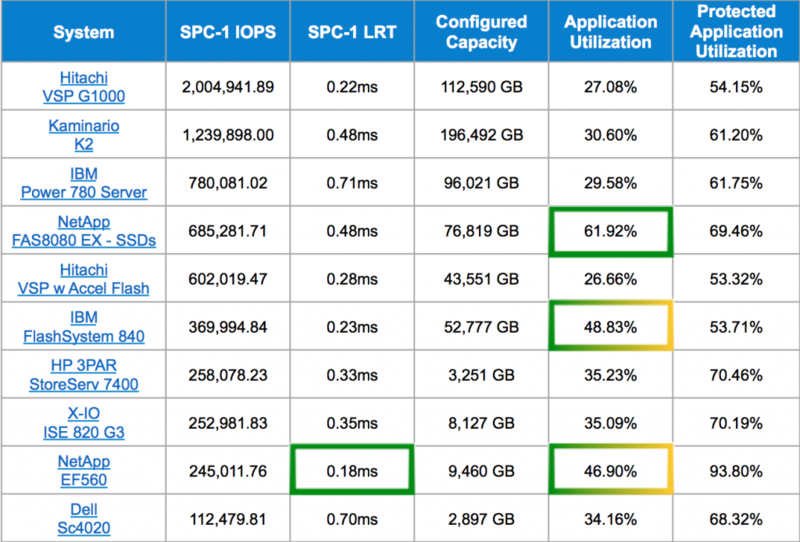 The ultimate capabilities of a storage subsystem to provide minimum I/O request response times in on OLTP environment is documented by the SPC-1 LRT result. 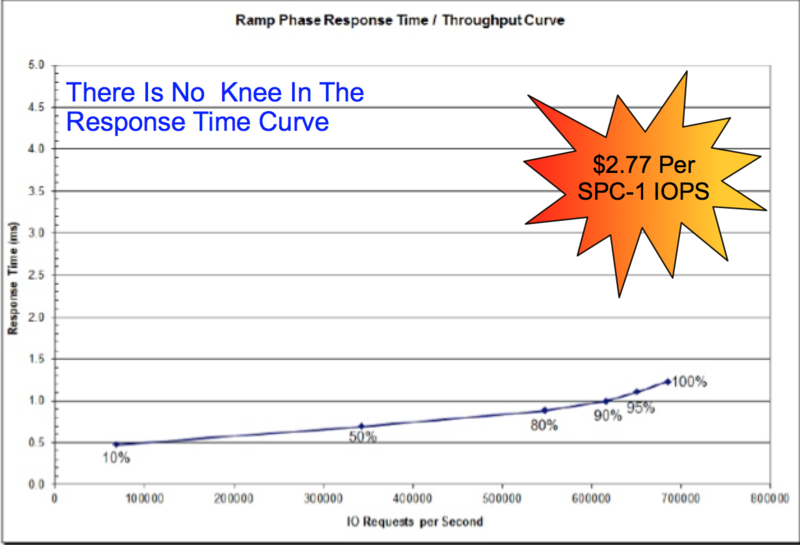 The final reported SPC-1 LRT metric is computed as the Average Response Time of the 10% load level Test Run. 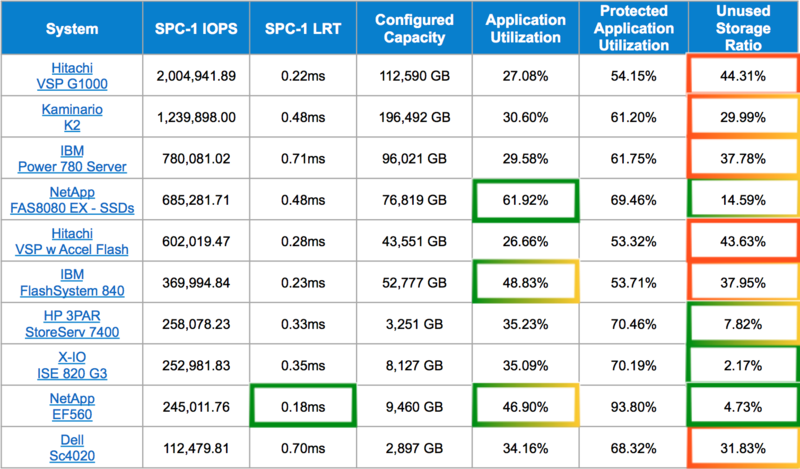 Bottom Line: The ultimate capabilities of a storage subsystem to provide minimum I/O request response times in the SPC-1 environment is documented by the SPC-1 LRT result. The lower (smaller) the LRT, the quicker, or more responsive, a system is considered to be. This response time chart demonstrates a very desirable curve. The amazing performance was achieved with a single drive enclosure and a mere (24) 400GB solid state drives. 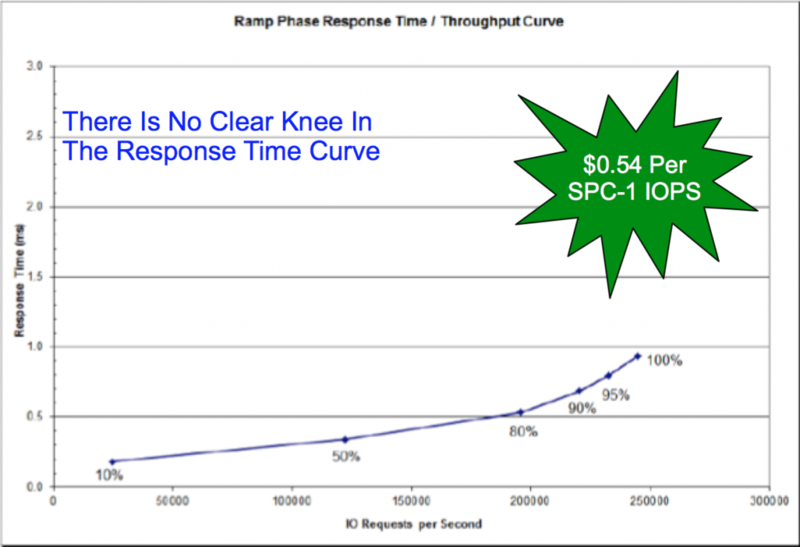 100% of measure response time is delivered at less than one millisecond. Stew on that for a second. Have you asked your account rep about the E/EF-series arrays yet? You should! 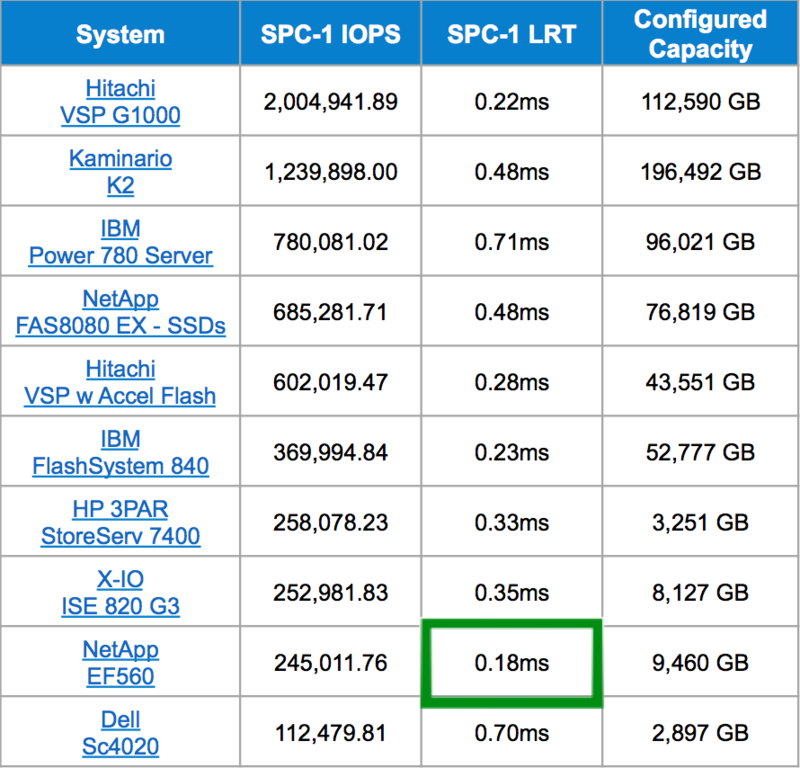 Today, SPC posted an official result for the All-Flash FAS configuration of our flagship 8080EX box, ranking 5th in total SPC-1 IOPS delivered [as of April 22, 2015], with some awesome overall value and SPC-1 LRT the industry has ever seen. This response time chart demonstrates zero “hockey stick”. It is the ideal curve because there is NO CURVE. The FAS8080EX has an extremely flat, very consistent response time curve. It is linear from beginning to end which makes it very easy to plan application deployments, workloads, and greater ability to build budget planning. While the cost is higher than some of the less feature-rich systems, you must remember it is never about just a single number. FAS systems deliver multiple system efficiencies through very feature-rich software management, and this is based on our true list price. We didn’t discount. Neither did Kaminario. Kudos to them for that. None of you should be discounting, in my opinion, but unfortunately, that’s part of the testing parameters. Yet another thing to keep in mind when you’re digesting this torrent of information. It is very import to examine the size of systems that a vendor tests. The portion of capacity that is used in the benchmark is broken into three Application Storage Units (ASUs), which is where the SPC-1 workloads run. Typically systems running the SPC-1 benchmark are configured in some variation of RAID 10. This often has a severe impact on useable capacity & value. Bottom Line: The Storage Performance Council mandates that vendors meticulously document their storage configurations. Vendors are required to specify how much of the storage system they are using. This is important information because it helps demonstrate how efficient various systems truly are. I’ll let you go and find your favorite vendors configuration they used to test. I bet you’ll be shocked at just how much gear it took to achieve some of the numbers. We’ll get to that in a bit. Application Utilization is determined by taking the Total ASU Capacity divided by the total Physical Storage Capacity. This illustrates how much of the actual capacity in the storage system was used to achieve the benchmark result. You’re on the lookout here for larger percentages! That 62% number for the FAS8080EX essentially means that we were using 62% of our total physical capacity to reach the numbers we did. The lower the percentage means tons more gear, and much higher price, which is why you’re seeing them heavily discount their test results. Protected Application Utilization is calculated as the TOTAL ASU capacity plus DP capacity (typically 2x) MINUS the unused data protection capacity divided by physical storage capacity. Bottom Line: This helps to demonstrate just how much of the total capacity is being eaten up through whatever RAID scheme is being used by each vendor. This is the heart of efficiency, right here, folks. As a hard line in the SPC-1 test, this may not exceed 45%. You’re looking for the smallest percentages of unused storage in the tests. Bottom Line: This is an excellent way to quickly determine which systems are delivering the best capacity efficiency, and which systems must be needlessly large to achieve performance. 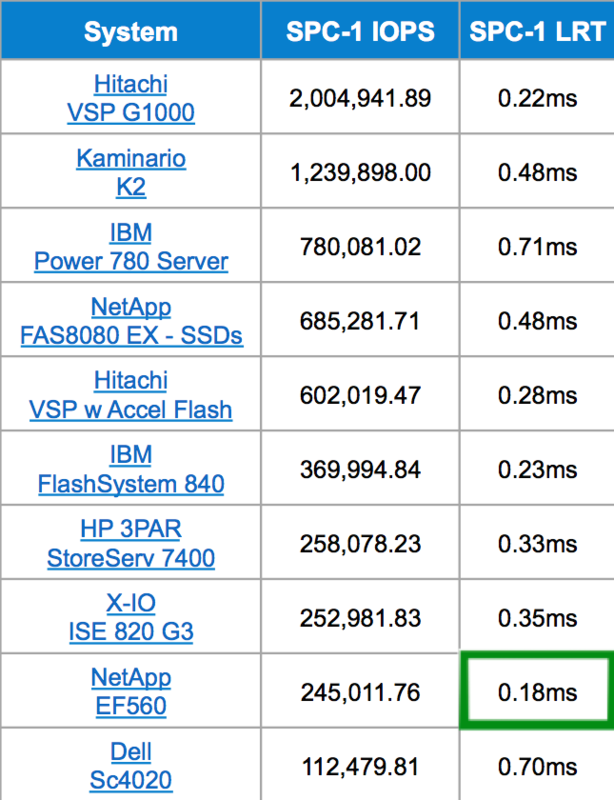 First, NetApp’s EF560 has officially set the bar and established a #1 ranking in $/SPC-1 IOPS for systems in the sub-millisecond arena. Which is arguably most of them at this point. The EF560 is the PERFECT all-flash system for minimal overhead and all-horsepower. If you’re looking for the best valued all-flash array to run your applications that need the most extreme performance, this is the absolute best you’re going to find in overall value and efficiency. 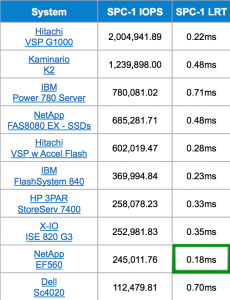 Second, NetApp delivered some of the most amazingly consistent performance with the “All-Flash FAS (AFF)” in an 8-node clustered Data ONTAP configuration. This is the sheer definition of no compromise, high performance, clustered scale-out shared storage, bringing along with it all of the advanced features you’ve known and loved for years. We have the #1 Storage OS, #1 replication technology, the only unified architecture All-Flash solution – and can include hybrid and integrated data protection with any hypervisor integration. On top of that, we can throw in software-defined, scale-up, scale-out, x-as-a-service, converged and any other technology that comes out next with more resources than any other competitive offering. Consider the stake(s) officially in the ground. Lastly, this is now public knowledge. Via these public benchmarks, NetApp has now proven they have a highly successful portfolio with the right solutions to handle an immense and vast variety of customer needs. The data used here was compiled from public reports via the Storage Performance Council results. Big thank you to the analysis team at NetApp for compiling all of this information and allowing me to share it with my readers! Per SPC regulatory requirements for publication, I am required to list the results from other vendors used in this post.